We love the performing arts and a highlight is happening on a screen near you soon. The Sleeping Beauty, coming to theaters for one night only, on Sunday, January 22 at 11:55 AM CT, is a special Fathom Events opportunity that lets individuals experience the enchanted fairytale classic by broadcasting live from the Bolshoi Ballet in Moscow. This event is only in select cinemas nationwide. Having attended the Bolshoi Ballet and seeing the beloved Swan Lake, I can assure you this would be a magical evening seeing it on the big screen. The music is by Pyotr Ilyich Tchaikovsky. The choreography is by Yuri Grigorovich and here’s more of the talent attached to the project… the libretto is Ivan Vsevolozhsky and Marius Petipa (after Charles Perrault) and the cast consists of The Bolshoi Principals, Soloists and Corps de Ballet. In this resplendent and magical classic, the Bolshoi dancers take us on a dream-like journey through this classic fairy tale complete with jewel fairies, a magical kingdom, a youthful princess and a handsome prince in this purest style of classical ballet. The Bolshoi’s sumptuous staging with its luxurious sets and costumes gives life to Perrault’s fairy tale unlike any other. 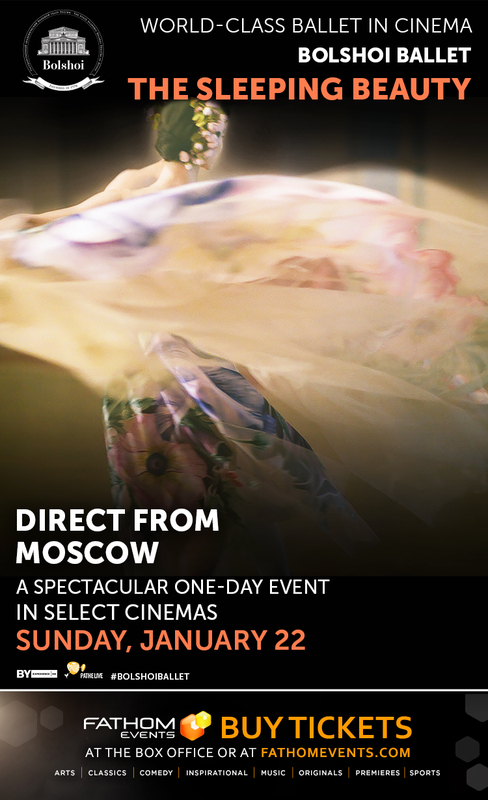 It’s a can’t miss opportunity – this must-see event can be seen at theatres everywhere, so visit http://fathomevents.com/event/bolshoi-the-sleeping-beauty/more-info/details on how you can enjoy this tour de force. Also, click here for more information about the complete Bolshoi Ballet 2016-17 Season.